But nowadays, where kids born in the 70s and 80s, are having their favorite toys and games adapted into main-stream movies. LEGOS have been around for a very long time. I remember playing with them for years on end, building dinosaurs, cities, and spaceships. It seems that for several years, LEGO went off the radar, but over the past few years, they have made a comeback in an epic way. Now, there are LEGO boutique shops at almost every mall across America, not to mention a LEGO theme park called LEGOLAND. And we have been seeing more and more movies and tv shows selling their rights to LEGO, in order to sell LEGO-themed products. We’ve seen ‘Star Wars‘, ‘Lord of the Rings‘, and ‘The Simpsons‘, to name a few, all now part of the LEGO world. It was only a matter of time before there was big LEGO movie with A-List stars attached to be released. Well that time has finally come, and I’m here to say that it is everything I could have hoped for and more. Just like the song you hear in the amazing trailer, “Everything is Awesome”, that is how you can describe the ‘LEGO MOVIE‘. It’s rare when I have high hopes for a film, and then the film delivers on every level. I’m just glad it happened with this particular movie, as I’m sure fans of all ages will thoroughly enjoy this beautifully animated film. 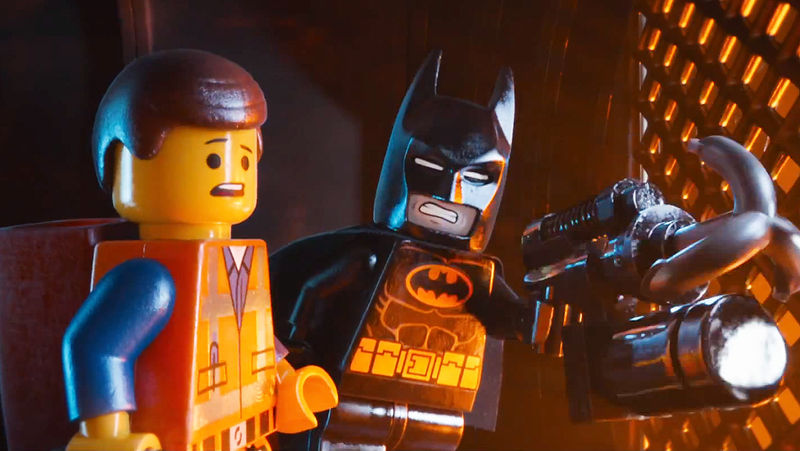 Phil Lord and Christopher Miller, the two guys who gave us ‘Cloudy With A Chance of Meatballs‘, the remake of ‘21 Jump Street‘, and the hilarious tv series ‘Clone High‘, did a knock out job with the ‘LEGO Movie’. The conjured up one hell of a cast that delivers on every note, along with some beautiful animation that brightens up the screen everywhere, and have given us a script that will not only make kids under the age of 10 laugh, but will also get the adults to burst out with laughter as well. The film just works on every level. The story focuses on Emmet (Chris Pratt), who seems to be the happiest guy in the city. He loves his job as a construction worker and enjoys following the rule book. However, Emmet seems to normal and nobody really pays attention to him. 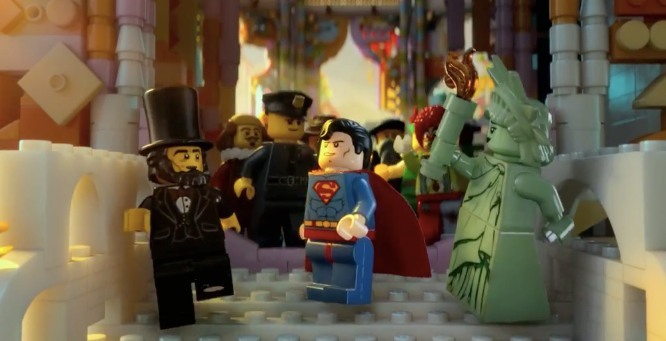 Meanwhile, there is an evil man trying to take over all of LEGO world who calls himself Lord Business and doubles as President Business (Will Ferrell), the nicer face to the people, as to trick them into his villainous scheme. Vituvius who resembles a ‘God’ like figure (Morgan Freeman, of course), tells of a prophecy of a special guy who will one day realize his abilities and save the world from Lord Business. Well, this happens to be Emmet, as he pairs up a hip chick named Wyldestyle (Elizabeth Banks), to set out on an adventure to recruit a bunch of other people to destroy Lord Business. They enlist the help of Batman, Superman, Green Lantern, the Star Wars characters, a unicorn-kitty, and just about every other pop culture icon you think of. The results are hilarious, as each actor lending their voice does a perfect job. Will Arnett as Batman is genius casting and the Star Wars cameos made me excited once again for a ‘Star Wars‘ movie. The different worlds in the LEGO world all bring back tons of nostalgic memories of growing up, and are all laid out perfectly here. The pacing is quick, and there is never a dull moment. I couldn’t stop singing the ‘Everything is Awesome’ song for two days after I saw the movie, and my only thought was that I had to see this movie again. I can easily say that ‘LEGO MOVIE‘ is one of the best films of the year so far. Sure, it’s only the first week of February, but it really is that good. Rush out to see this film. You’ll love it. This entry was posted on Wednesday, February 5th, 2014 at 4:00 pm	and is filed under Film, News. You can follow any responses to this entry through the RSS 2.0 feed. You can skip to the end and leave a response. Pinging is currently not allowed. « Emma Watson Set To Star in ‘Regression’!! No one leaves the Fraternity, Cross. I have a new perspective on the Fraternity. Careful. You don't destroy something that's been around for a thousand years. It's already destroyed. He broke the code. I have to stop this. So why don't you face me yourself? They were just decoys. Goodbye Mr. X.